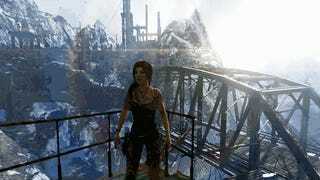 The game's silences were ones filled with tension and dread, interludes where my worries about getting Lara through the experience would fester. 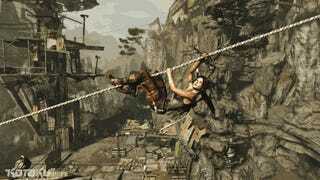 All throughout Crystal Dynamics' reboot of the archeological adventure series, players are left to wonder how the awful mythology of its fictional island was going to chew them up and spit them out. What terrible injury or revelation would Lara have to endure next? The relief I felt after finishing the game was replaced by something unexpected: a hush filled with possibilities to uncover. I went back into Yamatai to just fool around a bit before logging in some multiplayer. I was expecting to be bored, since all of the combat sequences had been cleared. But I wasn't stifling yawns. Instead, I was awestruck by how quietly beautiful the new Tomb Raider became after all the surviving was over and done. The realization hit me hard when I went back to the Summit Forest area, where one of the game's tensest sequences happened. On my first go-round, this was the part of the game where Lara was forced into stealth. I remember clenching the Xbox 360 controller nervously, trying to quietly pick off the Solarii thugs stalking me. But now, after the storyline's end, the same wooded expanse where enemies stalked me in the darkness felt full of stark beauty. Deer gambolled around me and I could climb trees unhurriedly, gathering salvage and enjoying the vantage points with no threat. One nook I'd never ventured into held the wolves that the Solarii sicced on me after I failed at staying hidden. They were still there, growling at me from inside their cages. I nocked an arrow and killed one. I immediately felt bad. These animals weren't threats anymore. The men that made them into monsters were all dead. And their whispered hate and noise went with them, replaced by bullfrog croaks and leaf rustling. Things could be different now. The same new perspective held true for the wintry peaks of the Mountain Base or the ramshackle structures of the high-altitude Gondola Transport. I'd almost died in most of these places but now I had a weird nostalgia about them. And even more counter-intuitively, I admired the ingenuity of the messed-up cultists who were trying to kill me. And not just the modern-day Solarii, either. Without bad guys firing machine guns at me, I could marvel at the tenacity of all the people throughout the centuries who were stuck on Yamatai before Lara's shipwreck. They made the island a little less cursed, planting the melancholy seeds that brings Lara into her new destiny. In the absence of violence, you could really feel how this place shaped Lara into something tougher. Now, some of the island's locales would never feel pretty. Places like the Geothermal Caverns (where crazy prisoners still chattered at a returning Lara; I killed these guys, too but didn't feel quite as bad about that) or the Chasm Shrine seethed with the fatalist lore that gives the game its urgency. There wasn't any awe in combing over these locales. I felt only a distant sadness wading through the moats of blood, mixed with new appreciation as to how well the game's visuals were executed. The most important takeaway might be how raiding a tomb doesn't feel like a mood-breaking indulgence, after the game's narrative resolves. It feels like Lara's true calling, like what she's supposed to be doing. It's not just modern game design busywork, like, say, hunting down Riddler trophies in Batman: Arkham City. Every tomb I figured out felt like another step toward moving Lara away from horror and towards the derring-do of her previous incarnation. Granted, she'll probably wind up somewhere between the extremes of her past and present. For now, it's nice to imagine that this quiet post-game cocoon is where the next step in Lara Croft's re-evolution is happening.